1. 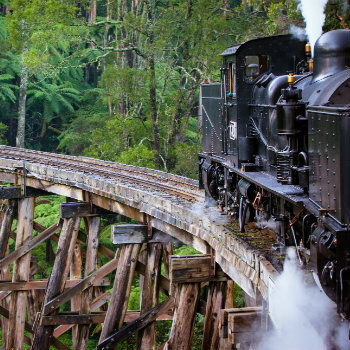 Take a Puffing Billy ride - The Puffing Billy train ride is one of the most popular steam train rides in Australia. Now a major tourist attraction, Puffing Billy departs from Belgrave 3-4 times daily depending on conditions. Special events such as “Thomas The Tank Engine” days and murder mystery themes are also available. 2. Stop by at Emerald Lake Park for a picnic - Visitors can explore and enjoy a picnic in the park either before or after their Puffing Billy journey. A great place for families and kids, the park has BBQ facilities with plenty of picnic tables​, a wading pool and playground facilities. You can also choose to hire paddle boats. 4. Discover The Villages of Mt Dandenong - A trip to the Dandenong Ranges is not complete without a visit to the three main villages of Mt. Dandenong: Mount Dandenong, Olinda and Sassafras - all within 2km of each other. If you haven't yet visited the Villages, it should be on your bucket list. The atmosphere of the Villages will leave you feeling completely refreshed and revitalised.